The Drive Interview with Jerry &quot;The King&quot; Lawler Jerry "The King" Lawler joined Brad Bobo on The Drive on KNEA to talk about his career and his trip to Jonesboro. A-State Nation Interview with Adam Kennedy Adam Kennedy, former quarterback at Arkansas State and Utah State, joined Randy Myers and Keith Merritt on A-State Nation to preview Red Wolves-Aggies. A-State Nation Interview with Blake Guinn Blake Guinn, Sports Director at KAIT 8, joined Randy Myers and Keith Merritt on A-State Nation to talk about his new position at KAIT. 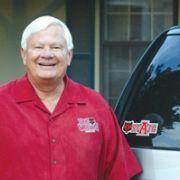 A-State Nation Interview with Mickey Ryan Mickey Ryan, Associate Athletics Director for External Relations at Arkansas State, joined Randy Myers and Keith Merritt on A-State Nation. The Drive Interview with Kamen Entchev Kamen Entchev, sports reporter for KAIT 8, joined Brad Bobo and Kara Richey on The Drive on KNEA to preview the 107.9 KFIN high school football game of the week- Batesville at Jonesboro. The Drive Interview with David Rehr David Rehr, head volleyball coach at Arkansas State, joined Brad Bobo and Kara Richey on The Drive on KNEA to recap the season and look ahead to the Red Wolves first home game against Texas State. The Drive Interview with Isaac Draxler Isaac Draxler, publisher for UStateAggies.com, joined Brad Bobo and Kara Richey on The Drive on KNEA to talk Aggies football. The Drive Interview with Robbie Neiswanger Robbie Neiswanger, Razorback writer for the Arkansas News Bureau, joined Brad Bobo and Kara Richey on The Drive on KNEA to recap the Hogs win over Texas Tech and look ahead to Northern Illinois. A-State Nation Interview with Matt Wells Matt Wells, head football coach of Utah State, joined Randy Myers and Keith Merritt on A-State Nation to talk Aggies football. A-State Nation Interview with Walt Bell Walt Bell, offensive coordinator at Arkansas State, joined Randy Myers and Keith Merritt on A-State Nation to talk Red Wolves football.